President Donald Trump speaks in the Cabinet Room of the White House in Washington, April 9, 2018, at the start of a meeting with military leaders. President Donald Trump called the raid on his personal lawyer Michael Cohen's office "a disgraceful situation," an "attack on our country" and a "whole new level of unfairness." "It's a total witch hunt," the president said at the start of a meeting with senior military leadership Monday. "I've been saying it for a long time. I've wanted to keep it down. I've given over a million pages in documents to the special counsel. They continue to just go forward, and here we are talking about Syria, we're talking about a lot of serious things ... and I have this witch hunt constantly going on for over 12 months now. When asked why he does not fire Mueller, Trump said, "We'll see what happens. I think it's disgraceful, and so does a lot of other people. This is a pure and simple witch hunt." Trump added that when he fired former FBI chief James Comey, it "turned out, I did the right thing." According to The Washington Post late Monday, Cohen "is under federal investigation for possible bank fraud, wire fraud and campaign finance violations, according to a person with knowledge of the case." 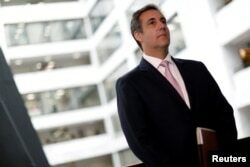 The FBI raided Cohen's New York office on Monday and seized documents, including those related to Trump's alleged affair with an adult film star. The New York Times was first to report the raid. 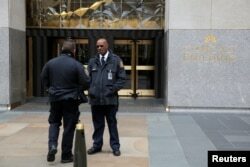 Police and security stand outside 30 Rockefeller Plaza, the location for the offices of U.S. President Donald Tump's lawyer Michael Cohen which was raided by the FBI today in the Manhattan borough of New York City, New York, April 9, 2018. Stephen Ryan, Cohen's attorney, said federal prosecutors obtained a search warrant on a referral from special counsel Robert Mueller. Mueller is investigating possible collusion between the Trump campaign and Russian interference in the 2016 election. Ryan called the search "completely inappropriate and unnecessary." "It resulted in the unnecessary seizure of protected attorney-client communications between a lawyer and his client," Ryan said. He also pointed out that Cohen has been cooperating completely in all probes into Russian election meddling, including "providing thousands of non-privileged documents" to Congress. Mueller's office has not commented. Although Mueller's probe is focused on Russian election interference, under law, he would need approval by the U.S. attorney general if he discovers something else during his investigation that he deems worth looking into. Since Attorney General Jeff Sessions recused himself from the Russian election probe, Deputy Attorney General Rod Rosenstein would have been the one to ask judges to approve the FBI raid on Cohen's office. Cohen paid actress Stormy Daniels $130,000 in the days before the 2016 presidential election to keep quiet about an affair she allegedly had with Trump in 2006. Trump has said he was unaware of the payment, which some legal experts believe may have been an illegal campaign contribution to keep Daniels from speaking out and possibly destroying Trump's chances of getting elected.